At the beginning of each yoga class, the teacher guides us to set an intention. While grounding myself in the beginning of class and letting go of my to-do list for the day, I go with the words or mantra that comes up. The other day's mantra was "I am powerful." I breathed into it, and it felt right. Lately, on-the-mat, I've been working on really engaging my core - my power center - to enter poses with ease and grace. Now, I can't say my practice is always graceful as shown by the loud thuds on the floor from landing loudly while coming down from an inversion or falling out of balance. Yet, with each class and practice, I've started to understand how to really engage my core more and more. With that, new poses have opened up - like flying pigeon. Flying pigeon is a pose that requires opening your hips deeply and flying one leg behind you in an arm balance. When I first saw this post, my mind shut me down - "There's no way you'll ever do that." My mind shut me off from ever flying right away. Yet, my heart quietly popped in and over time though, "Hey, maybe I could try that and do it someday." It didn't happen all at once. I had tried it a ton of times before even lifting my foot off the ground. Then, it took even more times to balance with my leg pulled in. 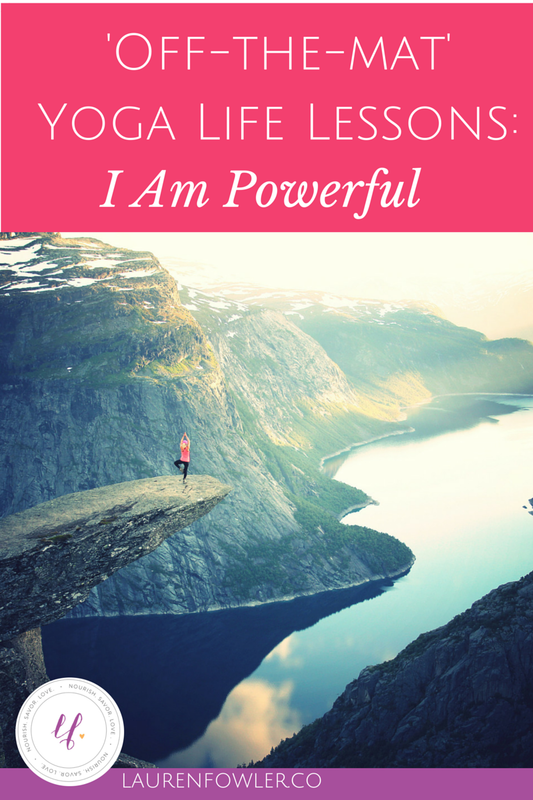 Finally, that day in class, I was balancing well, so I repeated that mantra to myself: I am powerful. I am powerful. I am powerful. Sure enough, my leg slowly flew back behind me into the full pose. I came out of it on a high. Yes, I was feeling good from the endorphins from moving my body, but this was a high from feeling my self-power. I realized that I am strong and powerful, in mind and body. I limit myself in arm balances when I enter the pose with the mindset of I can't do this or I'm not strong enough. Yet, I prove to myself that I can when I'm strong in my core and mindset. To bring this off the mat, I'm using the idea of feeling powerful in my business. It's easy for me to see strength in my clients - even when they only feel self-doubt - yet it's sometimes hard for me to find that in myself. When I'm feeling doubtful in my work with clients, my writing, or my ability to run my own business, I'm bringing my awareness back to this mantra: I am powerful. Think about how you can use this in your own life. Feeling like you have 'no control' around food. Feeling like you need to count every calorie. Feeling like your body isn't good enough. Feeling guilty if you eat a certain food. Instead of limiting yourself to your normal pattern of thinking, open yourself to a new perspective with this mantra I am powerful. If you believed in yourself - fully - how would you approach your relationship with food? Believing in yourself doesn't mean you'll fall - remember, I fell out of the pose time and time again before doing it. It means that you believe a healthy relationship with food and your body is 100% possible and that you're willing to fall, then re-commit to it. It means that when you find self-doubt creeping you, you can tap into a powerful part of yourself. It means recognizing that you always have a choice. Believe in yourself. You are more powerful than you can imagine. How can you use this intention in your life today?